Inaugural writer-in-residence John Asfour poses with life-size picture of Joy Kogwa, and the board members of the Historic Joy Kogawa House Society. Historic Joy Kogawa House is pleased to announce our first writer-in-residence, Montreal poet John Asfour. translated the poetry of Muhammad al-Maghut into English under the title Joy Is Not My Profession (Véhicule Press), and he selected, edited and introduced the landmark anthology When the Words Burn: An Anthology of Modern Arabic Poetry, 1945–1987 (Cormorant Books). was blinded in 1958 at age 13 during the Civil War there. “limited personality” that characterizes the second-language learner. consultation on work in development are also available. Further information can be found on the website of the Historic Joy Kogawa House Society at www.kogawahouse.com and TLC, The Land Conservancy of BC, at www.conservancy.bc.ca or by calling (604) 263-6586.
land trust, managed to purchase the house in 2006.
writers, readers, editors, publishers, booksellers and librarians. This entry was posted in Cultural Fusion, Joy Kogawa & Kogawa House, Literary Events, Main Page, Multicultural events on March 24, 2009 by Todd. Rob O'Dea is the latest survivor of the Hunger Strike Relay. The Hunger Strike relay was started on December 29th by community and housing activisit Am Johal. The protest raises awareness for the need for a national housing strategy—missing in Canada since 1993. Am passed it on to Michael Byers who I saw on his last day of the hunger strike, when he came to give a talk for CUPE 391 Vancouver Library Workers. I met Rob at the Jenn McGinn fundraiser at Figmint on Saturday night. He told me that he lost about 19 pounds in 7 days, on his liquid diet that did not allow for any soup or processed foods. Lots of juices and water. Luckily, Rob was able to drink some beer at the fundraiser, but unable to eat any of the delicious appetizers being passed around on trays. Rob described being on the fast, as “very cleansing”, and said it really helped to bring clarity to his thinking. But it was also distracting due to hunger yearnings. He recommended keeping active, if you choose to volunteer for this hunger strike relay. Rob's goal was to try to help raise the profile of the hunger strike relay, which he did by sending letters to National leaders in Canadian Parliament. Rob started a Hunger Strike Blog on http://rabble.ca/blog/17095, and met with Jack Layton while he was in Vancouver last weekend. This entry was posted in Main Page on March 23, 2009 by Todd. comes in August for Vancouver's Pride Parade. Jack said he was also in Vancouver to attend an event for Don Davies, MP for Vancouver Kensington. Party”). If Robbie Burns was the ploughman's poet, then Jack Layton must be the workers' parliamentarian. 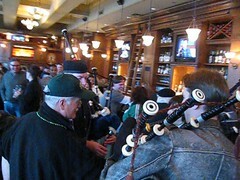 Just as Jack Layton was preparing to leave the pub, our bagpipers started playing some songs. Jack took out his cell phone and started videoing them, then recorded a Happy St. Patrick's Day message. Maybe this will appear on his web page. I used my camera to record the action. 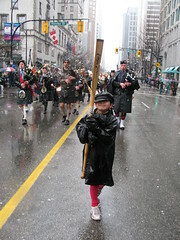 This entry was posted in Bagpipes, Canadian Identity & Heritage, Cultural Fusion, Hapa culture, Kilts - wearing kilts, Main Page, Multicultural events, Music, politics and politicians, Scottish, Gaelic, Irish Celtic events and stories on March 17, 2009 by Todd. – but the inaugural parade debut of the Gung Haggis Pipes and Dragon Boat Drummers smiles in adversity! This entry was posted in Asian Canadian Cultural Events, Bagpipes, Cultural Fusion, Dragon boat with Todd Wong - Dragon Boat Coach, Gung Haggis dragon boat team information, Kilts - wearing kilts, Main Page, Multicultural events, Scottish, Gaelic, Irish Celtic events and stories, Todd Wong, Vancouver Area Adventures on March 16, 2009 by Todd. CELTIC FEST – Lots of events… where will I be? Saturday I will check out “Battle of the Bards” King O' Men (about Robbie Burns, and the annual Gung Haggis Fat Choy entry in the St. Patrick's Day Parade. Celticfest started on Wednesday and goes to Sunday March 15th. St. Patrick's Day is on Tuesday March 17th. Check out the website: www.celticfestvancouver.com for lots of great events featuring Ashley McIssac, Lunasa, Irish Pipes Regiment, Battle of the Bards etc. etc. This year there is a play about Robbie Burns, titled King O'Men – featuring bagpiper Rob McDonald and actor John Hardie. All the more to celebrate the 250th Anniversary of the birth of poet Robert Burns. The annual St. Patrick's Day Parade is lots of fun too! We usually hang out at the Celticfest Village following the parade. This year's parade is on Georgia St. Starting at Broughton, the parade route heads East ending at Howe St. The Village is on the North lawn of the Vancouver Art Gallery. 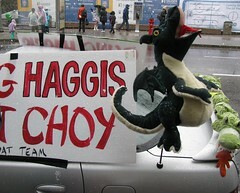 Check out my story from last year: www.GungHaggisFatChoy.com :: Gung Haggis Fat Choy puts a dragon (not a snake) in the parade. Here are 3 events that I will be attending – hope to see you there! Three cheers! 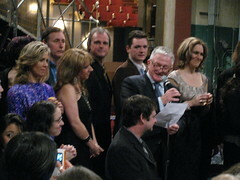 The Battle of the Bards is back for 2009, whisking you along on a flying tour of Granville Street’s best Irish pubs. slam-style contest, judged by members of the audience in each venue. the help of improv fiddler Caitlan Read. Who will be this year’s “top bard”? Why don’t you be the judge! the tunes Robert set words to. literary son as well as those who are new to Burns’ story and works. 3rd floor – 929 Granville St. 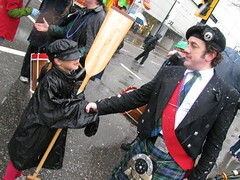 This entry was posted in Bagpipes, Literary Events, Main Page, Multicultural events, Robert Burns & Burns poetry, Scottish, Gaelic, Irish Celtic events and stories, Theatre, Upcoming Events, Vancouver Area Adventures on March 14, 2009 by Todd. 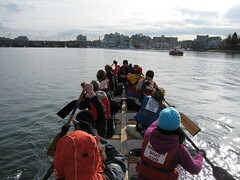 Dragon boat paddling on Sunday morning in sunshine – before the snows fell. Snow was predicted for Sunday morning, March 8th… and we were scheduled for 2 sessions of dragon boat practices. Dragon boat paddling is always fun when it's sunny. 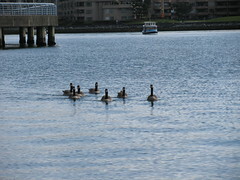 Teams that want to do well at the big Rio Tinto Alcan Dragon Boat Festival start practicing early. March is a good time to start. The weather is warmer, the sun comes out. Except Vancouver got yet another big dump of snow Sunday and Monday. We got out early on Sunday morning to paddle, as Ernest Wu and myself helped to coach and steer G-Force Winds dragon boat team, while their coach and founder Gayle Gordon is on holiday. Gayle joined the Gung Haggis Fat Choy dragon boat team last year as a veteran lead stroke… and WE LOVE HER! So we will do anything to keep her happy – including coaching her team while she is away. We like G. Force Winds. 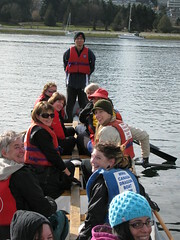 They are a very friendly group of paddlers who paddle for the fun and exercise. We helped them at some races last year with extra paddlers. It's an all women's team that emphasizes fun, friendship and fitness. Just like Gung Haggis without the haggis… or men. It's still early in the season and the roster isn't settled. Some paddlers probably find it too cold to paddle yet. But there were 5 rookie paddlers learning the art of paddling along with 7 experienced paddlers. Athena is wearing the blue hat and it was her second time in a dragon boat. Salome was a bit anxious for her first time in the boat, and worried if the other paddlers would like her, even if she wasn't any good. No worries. Everybody was happy, welcoming and supportive. When G.Force finished their practice at 11:30 and Ernest and I joined our regular team Gung Haggis Fat Choy dragon boat team where I am the coach and founder, and Ernest is one of our team captains. He was born in Beijing, China, so I lean on Ernest to fill in lots of things about Chinese culture that my 5 generation Canadian history doesn't know about. 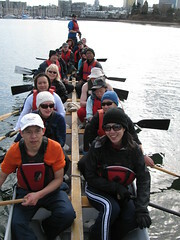 Ernest paddled a year of dragon boat before joining the Gung Haggis team. “Gung Haggis is like family,” declared Wendy last year… or was it the year before? Wendy really embodies the social cameraderie of the Gung Haggis Fat Choy dragon boat team. We are happy to have her at many of our social events – but this year, she gets to plan some of them! This will be Wendy's 4th year as a dragon boater. In her 2nd year, we became lead stroke. 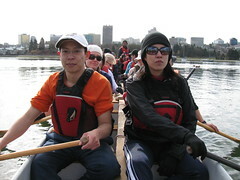 Tzhe also became a lead stroke in his second year of paddling dragon boats. He now enters his 3rd year of paddling dragon boat, after pulling a Ken Dryden by racing voyageur canoe with us in Fort Langley after joining the team at the end of 2006. Sitting behind Tzhe is Alissa, our rookie of the year, whom we had doing some lead stroke work in her first year of dragon boating! 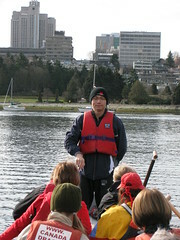 We paddled out to David Lam Park, and worked on building good technique by addressing different foundations of dragon boat paddling. We worked the core muscles. We practiced entries. We practiced timing. We worked in small groups. And the team really developed quickly and impressively. Steven Wong and Stephen Mirowski took turns steering the boat during practice. We rotate steers so that everybody gets a chance to paddle and learn steering responsibilities. We also rotate captains from race to race. This way we also share leadership responsibilities. 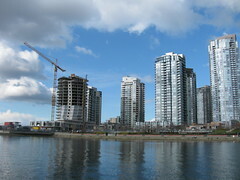 I've been paddling since 1997, and it's really given me an opportunity to witness the growth and development of False Creek. It's amazing to see these buildings going up at the corner of Beach and Pacific Blvd. It sure looks like they are building these new buildings crooked! 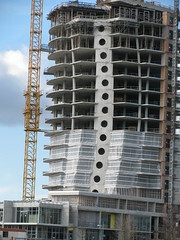 But believe it or not – it's supposed to be good for stabilization in case of an earthquake. This entry was posted in Main Page on March 10, 2009 by Todd. Blogger Night at the Opera… Rigoletto gets thrown to the net surfers! BLOGGERS RULE at the Vancouver Opera… Live Blogging for Rigoletto! Opera is one of the most intercultural art forms. It forces its audience to listen to foreign languages, as it tells stories from different cultures. Okay, it also presents a lot of stereotypes and racial chariactures too! But today's productions will balance historic stereotypes with 21st Century sensitivity for cultural diversity. Vancouver Opera has been one of the most innovative arts organizations to find new ways to market themselves, whether creating Manga comics for promotion, marketing to the Asian population base in Vancouver with the Voices of the Pacific Rim recital, or beginning live blogging with Carmen and now Rigoletto operas. Opening Saturday Night at Vancouver Opera, there are lots of people dressed up in the finery. The lineups are deep and long for the cappucinos or wine. 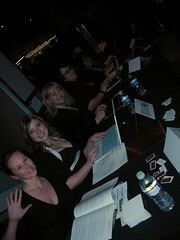 Over at the East side of the lobby, 6 bloggers sit madly typing into their laptop computers during intermission. It's Live Blogging Night at the Opera. It started with a few bloggers being invited to blog Carmen in January. And now a few more have been invited to blog Rigoletto. Some of the audience members are curious. Some are demanding. Some are complaining about the sound in the balcony. One audience member insists that they are not having a true opera experience unless they are drinking wine. One of the bloggers writes that she is having sooo much fun people watching, she finds it hard to touch type at the same time. I recognize Miss 604 Blogger, Rebbecca Bollwitt. She recognizes me and writes on her blog that “We were just visited by Karen Hamilton of TinyBites.ca who is here to enjoy the show as well as Gung Haggis Fat Choy. NetChick is a rower, now interested in dragon boat paddling. I tell her that my Gung Haggis Fat Choy dragon boat team has been featured on television documentaries for German and French public television, as well as the CBC. It would be pretty cool, if she joined our dragon boat team… we have lots of opportunities for blogging. Oops, I forgot to tell her we will have a parade entry in the annual St. Patrick's Day Parade. At the opera, it's always interesting to see who is there in the audience. I spy an older couple, a male caucasian with an Asian woman. They are always at major arts events. I think he used to work at the CBC. I chat with Doug Tuck, VOA Marketing and Selina Rajani, Communications/Media. I introduce them to my date for the evening, Alexandra Youngberg, my CUPE 391 Vancouver Library workers president. Alex loves this production of Rigoletto. She loves music and sings in a choir. Alex has even sung O Solo Mio, while I played my accordion. Donnie Ray Albert who plays Rigoletto. It's quite the multicultural cast. Donnie Ray is African-American, born in Louisiana. Eglise is born in Cuba. Sam Chung, Chinese-Canadian born in Winnipeg, steps out of the Vancouver Opera chorus to play his first supporting role with Vancouver Opera in the role of Matteo Borsa. I congratulate Sam at the reception following. 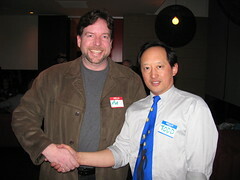 During the reception, I also chat with Michael Mori, who is hapa Japanese-Canadian. Kinza Tyrell, chorus master tells me how exciting this production is, and asks me how I know Sam and Michael. “Well… through events at Joy Kogawa House, because we really supported, and raved about the Naomi's Road opera. My old friend Walter Quan is here! We first met back in 1986, while we were volunteers for the Salt Water City exhibit celebrating 100 years of Vancouver Chinatown history. We recently had lunch in Victoria 2 weeks ago, when I had to return the life-size photos to the Royal BC Museum. Opera Manager James Wright spots me, and waves at me. So does orchestra concertmaster Mark Ferris, who along with his wife Gloria, have been friends for years. Mark performed at the 2004 Gung Haggis Fat Choy dinner. Meanwhile, the bloggers are noshing at the food tables, taking pictures of the event, and chatting amongst themselves. I think it's great that Vancouver Opera is connecting with bloggers. Back in December 2004, I blogged my own review of the VOA production of Madama Butterfly: Madama Butterfly Review: Vancouver Opera Nov 27 to Dec 11. This entry was posted in Asian Canadian Cultural Events, Commentaries, Main Page, Multicultural events, Music, Recent Reviews, Theatre, Upcoming Events, Vancouver Area Adventures, Visual Art and related events on March 8, 2009 by Todd. 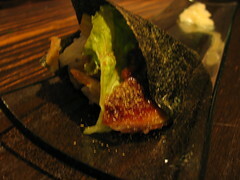 We went to Hapa Izakaya Kitsilano on Thursday night. My girlfriend Deb was entertaining her friend Peter and his girlfriend Emily from Seattle. It was Peter's birthday. We went to Deb's favorite new restaurant. Hapa Izakaya Kitsilano has only been open for about a year. Owner Justin was there to greet us. 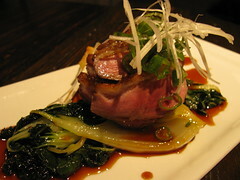 The original Hapa Izakaya is on Robson St. near Jervis. And just like the original, almost every dish begs you to take a picture! And it is ohhhhh…. so tasty. Peter and Emily were very impressed. They said, “Ahhhh….” and “Mmmmm” and “That is SO good!” a lot. Owner Justin and his wife are “Hapa.” Half Japanese-Cnaadian and Hafl Caucasian-Canadian. They met while both were working in Tokyo. Hapa Izakaya brings the “Izakaya”/ Japanese Pub food to Vancouver, but pushes it up a level with its fusion cuisine. The Robson St. restaurant is very cool with its dark interior and club music. The Kitsilano restaurant is more laid back. 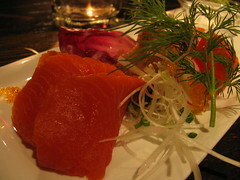 This entry was posted in Cultural Fusion, Food & Restaurants, Hapa culture, Main Page on March 8, 2009 by Todd. listening to that audience, but I also enjoyed the performance. they're missing when it comes to dance. myself empathizing with the men on stage rather than objectifying them. fall into, and it made me look at men (and myself) in a new light. women in the audience had a different perspective. equally aware of the difference between our two genders. movement of whatever body part they happened to be attached to. Choreographed by Wen Wei Wang. This entry was posted in Asian Canadian Cultural Events, Main Page, Multicultural events, Recent Reviews, Visual Art and related events on March 6, 2009 by Todd. Karen Larson's debut cd “Fire and Ice” is a classic style singer-songwriter album. see her mature over the past years. audience with her voice and beauty. This entry was posted in Main Page on March 4, 2009 by Todd.